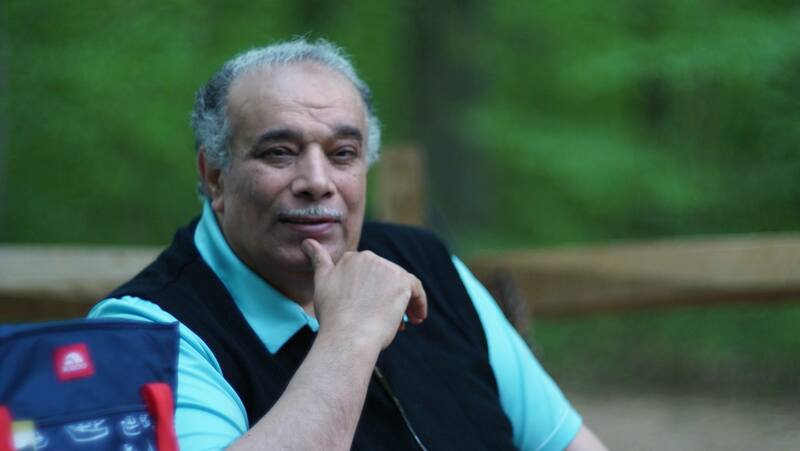 1- An Egyptian millionaire within the 1970s, during the Sadat era of open-door policy and economic boom of capitalism, opened his exportation and importation company and established a branch of it in NYC. This millionaire chose a pretty American young woman who held an MA degree in business administration to manage this NYC branch while he was in Cairo, Egypt. In fact, this millionaire admired this blond American young woman with her cultural and educational level and good traits and personal qualities; he decided to invite her to dinner in a very expensive restaurant to impress her; she told him she never entered into such a restaurant before; he ordered the waiter to bring the different and most expensive food items; the quantities he ordered would have fed ten people; both began to eat; she noticed that the man ate by his spoon of each plate on the table; she stood and told him angrily that she will not work for him anymore; he felt astonished by her reaction; she told him that he cannot be trusted; he is selfish and backward because he ordered food that would have fed ten people and he spoiled all plates, no one can consume such food items he would leave as he cannot consume all such quantities. She left him totally flabbergasted and he opened his mouth and his eyes were seared as he saw her leave the restaurant. 2- This Egyptian millionaire lived about 40 year ago; the filthily rich, affluent ones like him were given the appellation (fat cats) in the Egyptian press of the opposition. The billionaires of today in Egypt became fat cows and then fat whales during the era of Mubarak; they live inside their walled, heavily guarded 'colonies' at the coasts of the Red Sea and the Mediterranean Sea (with lofty palaces and mansions) and left the posh but crowded areas, districts, and suburbs of Cairo, the Egyptian capital. The supermarkets/megamarkets and palaces of such new cities or compounds of the affluent ones are more luxurious than those inside the USA. The affluent ones consume tender meat of the best parts of slaughtered animals and throw huge amounts of meat and food items into the garbage; guards do not dare to keep the thrown food; the penniless and the hungry in Egypt get their food from the garbage dumps like cats and dogs. 3- We have watched the following videos within YouTube. 3/1: An affluent woman in one of the Gulf countries who held a banquet to invite a female artist to her palace; huge amounts of food items (chicken, meat, and fish) that would have fed one hundred person were put on gold plates and containers; forks, knives, and spoons were made of gold as well; eventually, this woman and the female artist will consume the least amount of foot in one plate to keep their waistline and remain fit; the rest of such huge quantities of food items are thrown into the garbage bins. 3/2: Within banquets held in the KSA, tens of animals (i.e., cattle, sheep, and calves) are slaughtered to be barbecued and fill plates in more than ten huge tables, though one table would be more than enough to feed the invitees who will probably consume very little amounts of food; the rest of such huge quantities of food items are thrown into the garbage bins. 3/3: Many videos of hungry people inside the KSA who get their daily food from the garbage dumps to get their daily food like cats and dogs! 4- The above has nothing to do with Islam; this does not happen inside the USA. 1- They also get the following. 1/1: Part of the amount of money paid by them as taxes, as this is part of social solidarity as the government would get some money from the rich to give them to the poor. 1/2: If they have no steady jobs, they get monthly financial aid until they are employed, along with coupons of food to buy with them what they need in most stores and supermarkets, apart from wine and cigarettes they receive, and they are given houses if they are homeless; the government pays the rent of such houses on their behalf; their children get school education and free meals; the families of other students help pay for such free meals; the families of the needy ones receive food on a daily basis. Of course, all children, the handicapped, and old, poor people have medical insurance and free care. The poor families that adopt an orphan is given an enough pension and a house by the government. 1/3: Many churches offer food items (among other things) to all of the needy people; new immigrants, including Muslims, benefit from such donations. 1/4: Big stores and supermarkets offer their surplus (dairy products, meat, chicken, veggies, fish, fruits, pies, pastries, etc. ), before their expiry dates, for free to the poor who submit a written form to request food in order to register their names as among the needy ones; they take whatever they need for free. 1/5: This is not to mention open restaurants that offer free food (fresh and hot meals) at certain times to those needy ones who enter such restaurants. 1/6: Ordinary, employed Americans never use such features of course; those with low income or have no income enjoy all this and can get cheap food items (meat, fish, chicken, eggs, fruits, veggies, etc.) for free or in return for very little money to cook of themselves at their homes for less than 50 US$ per month. The poor ones inside the USA are never hungry; the poor ones inside Egypt suffer the soaring prices of all necessary food items. 1/7: The penniless Americans can consume food for free or for 10 US$ on a weekly basis in open buffet of meat, fish, chicken, fruit patisseries, etc. in several restaurants; this is impossible in Egypt. 1/8: What surprised us once we arrived to the USA in 2001 is getting very cheaply both new and second-hand clothes, appliances, and pieces of furniture from shops of Goodwill and Salvation Army. For instance, shops that sold a shirt for 60 US$ would donate the surplus unsold shirts or would sell them in return for less than 10 US$ to the poor in other shops. Many people donate their furniture and clothes to churches when they move from one State to the other or when they buy new items for themselves; many surplus items are given by churches to mosques; yet, the 'saints' who run such Wahabi, Sunnite harmful mosques make it their business to amass such items in huge storehouses and ship them from ports to sell them in return for high prices in Egypt and elsewhere, and they keep this money and never donate anything to the poor and the needy anywhere. 2- The needy there receive donations from the surplus; this is part of the civilization that maintains human dignity and knows the importance of human being. What is greater is Islam (i.e., the Quran) which entails that donations to the poor and the needy should be from things/money/food that the charitable ones own, cherish, and hold as dear to them, and not from the surplus. 1- The points above we have mentioned about the affluent Muhammadans contradict the Quranic sharia legislations. 1/1: Islam is the only religion that repeats in its Book, the Quran, many times the command to feed the poor and the needy. 1/2: Islam entails giving to the poor, the needy, and the hungry from the best items that one has and loves, and not the bad items or surplus. This is asserted in the following Quranic verses. 1/2/1: "You will not attain virtuous conduct until you give of what you cherish. Whatever you give away, God is aware of it." (3:92). 1/2/2: "Righteousness does not consist of turning your faces towards the East and the West. But righteous is he who believes in God, and the Last Day, and the angels, and the Scripture, and the prophets. Who gives money, though dear, to near relatives, and orphans, and the needy, and the homeless, and the beggars, and for the freeing of slaves; those who perform the prayers, and pay the obligatory charity, and fulfill their promise when they promise, and patiently persevere in the face of persecution, hardship, and in the time of conflict. These are the sincere; these are the pious." (2:177). 1/2/3: "And they feed, though they love this food, the poor, and the orphan, and the captive." (76:8). 2- The affluent Muhammadans have hearts of rock and stone; they are hard-hearted and cruel; this verse applies to them: "Then after that your hearts hardened. They were as rocks, or even harder..." (2:74). 3- The Omniscient Lord God is Aware of what the affluent Muhammadans do; He will destroy them, sooner or later, as was the case of disbelievers/polytheists within Quranic stories of previous prophets. Many affluent polytheists in our modern era have been punished and destroyed. 5- When we see conditions in Egypt, the KSA, Iraq, etc., we remember these verses about destroyed nations whose affluent ones lived in spacious mansions/palaces while leaving the necessary, vital facilities of the poor without mending them or making them work properly: "How many a town have We destroyed while it was doing wrong? They lie in ruins; with stilled wells, and lofty mansions. Have they not journeyed in the land, and had minds to reason with, or ears to listen with? It is not the eyes that go blind, but it is the hearts, within the chests, that go blind." (22:45-46). 6- The religions of the affluent polytheists – such as the Muhammadans – are deep-rooted, faulty notions revolving around deifying and sanctifying the 'good' ancestors/forefathers and the 'holy' traditions inherited from them; they assume that the so-called 'Umma'/nation of the Muhammadans, past and present, unanimously agree on such notions in their earthly/terrestrial, man-made religions. God says in the Quran: "Likewise, We sent no warner before you to any town, but the wealthy among them said, "We found our forefathers on a course as an Umma/nation, and we are following only their footsteps."" (43:23).